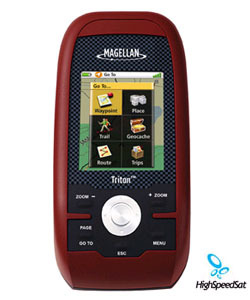 Magellan Triton 300 - Amazingly easy to use, it's the next-generation handheld GPS for precision outdoor navigation. Large, full-color display shows maps and data with crystal clear graphics. Rugged and waterproof with uploadable detailed maps to maximize routing capability. 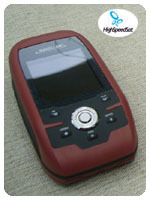 Magellan Triton reinvents handheld GPS. Triton 300 is amazingly easy to use with a smartly designed interface and simple menus that make navigation fun and effortless. The full-color crystal clear display shows all your maps and navigation information in brilliant, easy-to-view graphics. Instantly view all your maps, locations and saved tracks and waypoints using the intuitive scroll pad and direct-access buttons. Unlike other complicated devices that require you to scroll through screen after screen, Triton 300 gets you to the information you want in two or three clicks. Add detailed maps and applications to the available memory and further enhance your navigation experience. 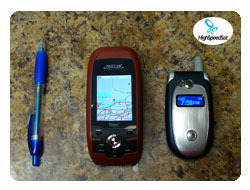 Plus, Triton is the first handheld GPS to offer compatibility with National Geographic maps. These highly detailed nation-wide topographic maps based on USGS 1:24.000 series quads, offer seamless scalability, multi-layer overlays and much more. Triton is designed for precision navigation, offering the fastest GPS positioning acquisition in the industry with the SiRFstarIII™ chipset. An integrated high-sensitivity antenna provides reliable signal reception even in heavy cloud cover, canyons or deep woods. Built-in signal augmentation reception (WAAS/EGNOS) provides 3-meter accuracy. Rugged and waterproof, your Triton 300 is built to withstand intense use, accidental impact and immersion in one meter of water for up to 30 minutes (IPX-7). It's ready to guide you on any adventure. The advanced features are also easy to use. View the elevation profile for the trail ahead (or any route) or even the track you just traveled. See the precise time of sunrise/sunset any day of the year. Get a calculation of the best hunting and fishing time. And much more. Triton 300 is built on the experience of hundreds of thousands of GPS users and nearly 20 years of precision positioning technology from Magellan: the first name in navigation. "4.65" x 2.16" x 1.22"